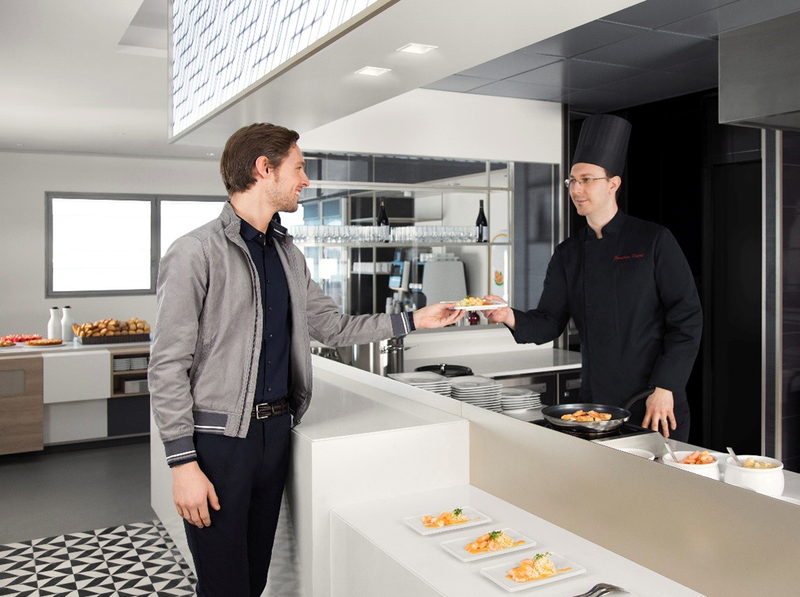 After having revealed the first part last January and having already welcomed more than 200,000 customers, Air France today presents its entire brand new Business lounge located in Hall L of Terminal 2E at Paris-Charles de Gaulle Airport. Several other areas for a tailor-made experience. When they arrive in the lounge, guests can easily find their way around thanks to an interactive plan at the entrance. They can browse all the services available, depending on how much time they have. 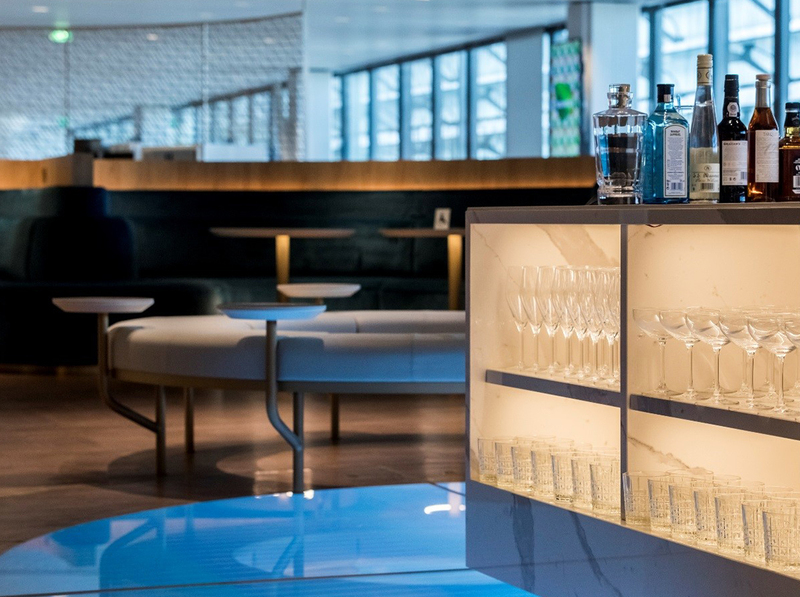 Air France has entrusted French designer Mathieu Lehanneur with the creation of a bar area where time seems to stand still in a 160 sq. m. space suspended between heaven and earth for the company’s customers. 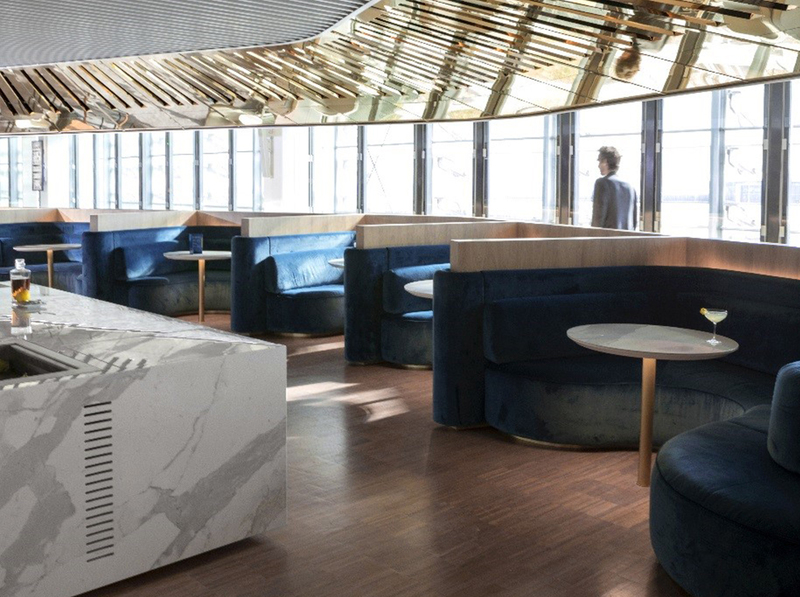 Located at the heart of the new Air France Business lounge, “Le Balcon” is set against the runways in a unique and welcoming architecture, forming a curved structure sheltered under an immense golden mirrored ceiling. The space includes a central bar and a succession of outlying theatrical box seats where passengers can relax and enjoy the comfort prior to their flight. Each box is upholstered in blue velvet and embroidered with their respective numbers, and features a large sofa, a pedestal table and the latest connectivity services. Mixing wood, marble, mirrorwork and light, “Le Balcon” is at the same time chic, immersive and digital. At the heart of Le Balcon, every evening from 19:00 to 21:00, Air France offers a selection of cocktails* specially designed by the head bartender of the Hotel Lancaster in Paris. *The consumption of alcohol is dangerous to your health. 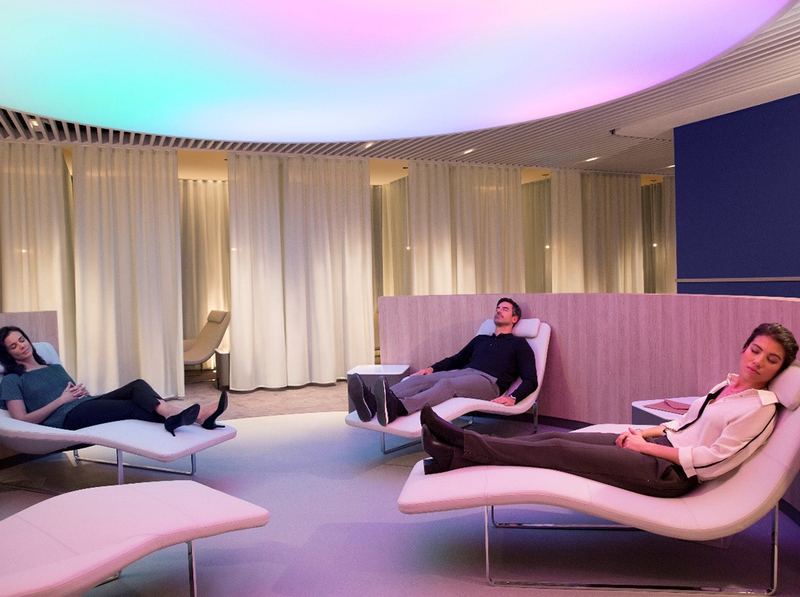 The largest wellness area of all the Air France lounges, with more than 550 sq. m.
In a refined setting, everything has been designed to plunge the customer into a cocoon where time seems stands still. A three-dimensional digital sculpture radiating at the heart of the wellness area. A surprising piece of artwork that changes shape, intensity and colour throughout the day. Two large co-working tables with individual sockets to work quietly. Two press kiosks, located on both sides of the bar offering French and international newspapers and magazines, in addition to the offer available on the “Air France Play” app. This space has been specially designed for children from 4 to 12 years old. Both cosy and fun, it combines refined decoration and splashes of fantasy, making it a place of rest and entertainment. Young travellers can enjoy the entertainment offer on their own or with others, thanks to two Sony PS4s with exclusive new games. They can also put their creativity, memory and reflexes to work with the TablePlay by Novotel touch table. 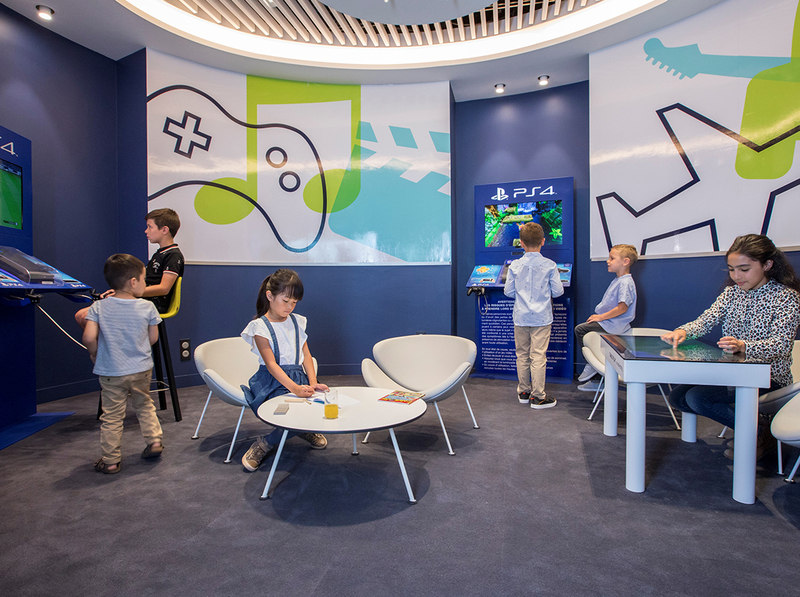 With this Kids area, the whole family can enjoy what’s on offer in the Air France lounge. 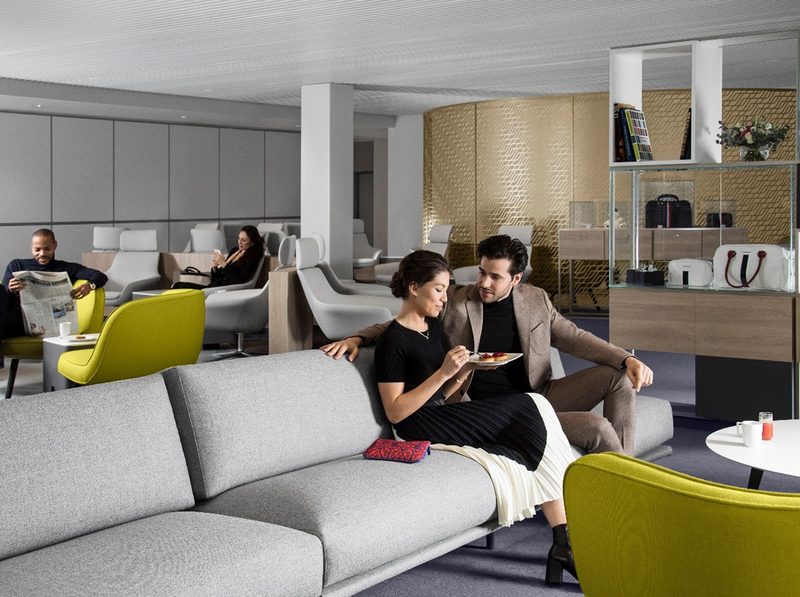 On the Air France app, customers can access all the information they need on the lounges in the new “Lounge” section.